Let's talk about Tuesday. 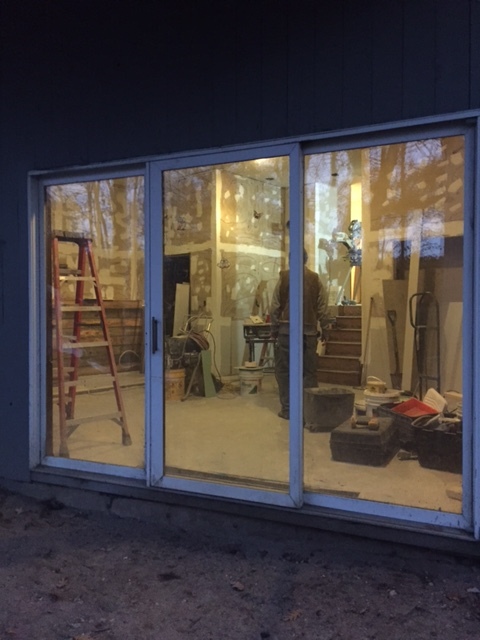 I was so excited to be at the house on Tuesday because the new garage door was supposed to be installed as well as the kitchen countertops. I was giddy with excitement. And then no one showed up. When my dad finally got a hold of the garage door people in the afternoon the guy said they'd gotten the wrong size door and would have to reorder it. Here's just a little note on that. If you realize you've made a mistake then you call your customer as soon as you realize and explain the situation and fix it. Do not wait for the customer to call you and ask what's going on. You will not get repeat business if you can't get your job done properly. Don't even get me started on our MIA roofers. Moving on, the countertop guys were supposed to show up between 11 and 2 and when they didn't I started to worry that I wouldn't get to see any of the cool stuff get done. So I called to find out what was going on and thankfully they were just running a little late. So I still got to see the countertops installed, yay! 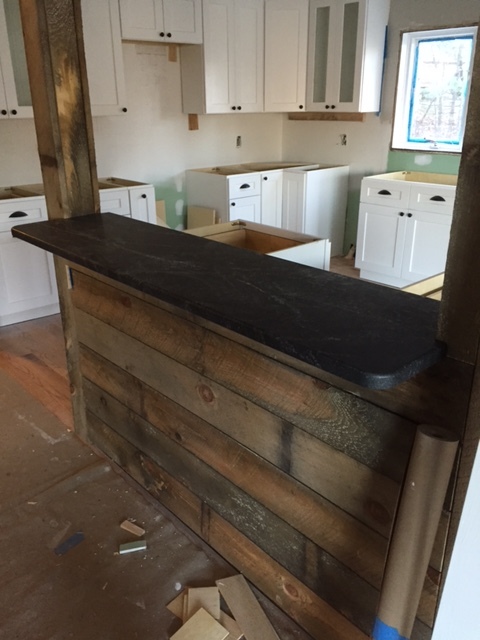 Below is the bar top, where I will stick those lovely stools that I fixed up last weekend. Don't you want to take a seat and eat your breakfast here? I sure do. 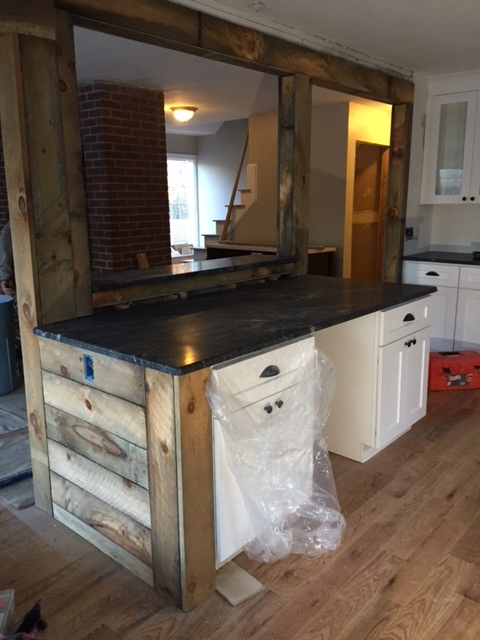 Quick note about the counter tops. The place we usually use had a longer wait time this go round, so I suggested we pop into Top Line Granite as we were driving back to the house from picking up materials on weekend, just to see. As I believe I stated in an earlier post, I had envisioned white shaker cabinets with a black or grey matte countertop. I just felt with the barn board around the island that a shiny countertop might be too much. I wanted to tone the glitz down, really stick with a classy rustic look. When we looked at the slabs at Top Line we liked two the best and in the end my dad liked this one the most. I didn't take a photo of the entire kitchen because by the time the countertops were completely installed in was dark out and the light wasn't great inside since there are currently no lights in the kitchen. But have no fear, I will post about the kitchen in its entirety soon enough. Just enjoy this little peek for now. I cannot believe this kitchen. It was SO dark and dingy before, this is gonna be epic. And you're so right about a giant Christmas tree going in the family room downstairs... perfect spot. Can't wait for more reveals! 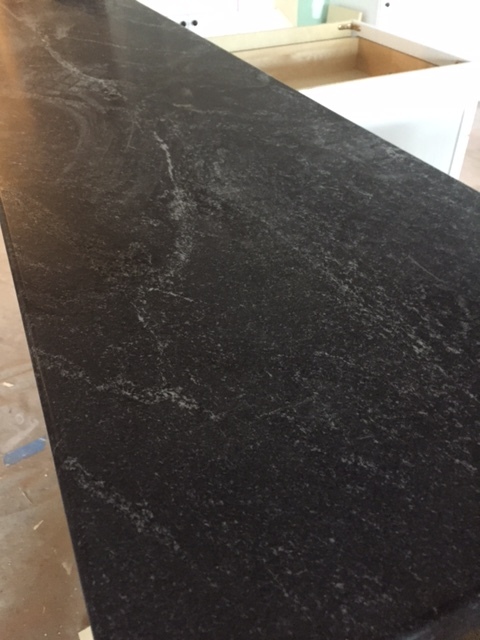 The counter tops are gorgeous! This is one lucky buyer.